Arrow Glass Table - 28" x 21"
Black iron crossed bar arrow legs with gold finish base tips and top end feathers, round clear glass tabletop with iron band rim. 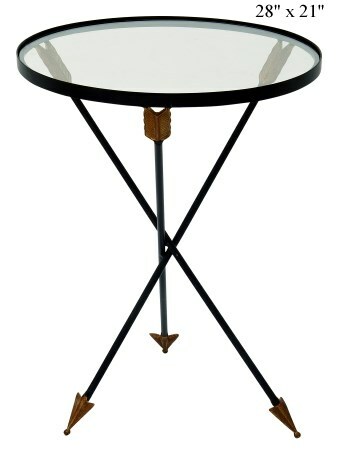 Round Side Table - 29"
Metal frame with a wood top. The inset is painted to give an 'enamel-look'. 2 Tier Tray Cart - 31"
Metal cart with an 'enamel-look' painting on both trays.